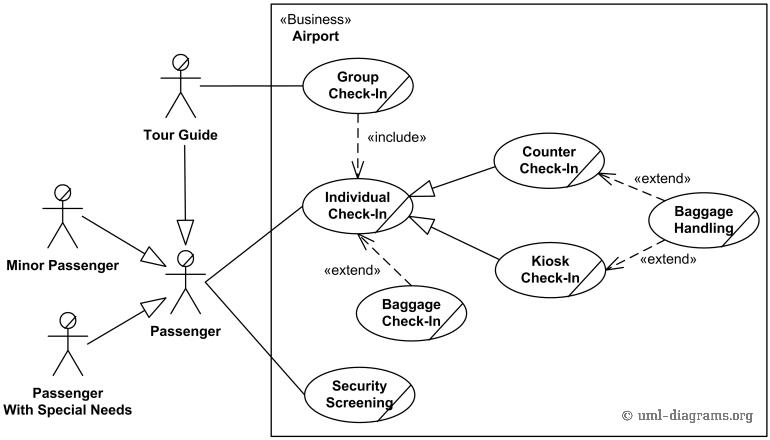 An example of use case diagram for an airport check-in and security screening - Passenger, Tour Guide, Minor (Child), Passenger with Special Needs, all playing external roles in relation to the airport business. This is an example of a business use case diagram which is usually created during Business Modeling and is rendered here in Rational Unified Process (RUP) notation. Business actors are Passenger, Tour Guide, Minor (Child), Passenger with Special Needs (e.g. with disabilities), all playing external roles in relation to airport business. Business use cases are Individual Check-In, Group Check-In (for groups of tourists), Security Screening, etc. - representing business functions or processes taking place in airport and serving the needs of passengers. Business use cases Baggage Check-in and Baggage Handling extend Check-In use cases, because passenger might have no luggage, so baggage check-in and handling are optional. An example of use case diagram for airport check-in and security screening. This document describes UML 2.5 and is based on OMG™ Unified Modeling Language™ (OMG UML®) 2.5 specification [UML 2.5 RTF - Beta 2].